GALION — The Galion Graders are getting ready to start up season number three as members of the Great Lakes Summer Collegiate League. With the roster set, two new coaches added to the staff and a community behind them, the Graders hope to improve on their first two seasons in the league. The team finished at 12-30 in 2016 after finishing 16-22 in the inaugural 2015 season. Players for the Graders reported for the first time Monday, June 5 after completing their seasons at their respective colleges and universities. The Galion squad this season will be comprised of players who call Galion home, but play collegiate ball all over the country. Galion competes in the Great Lake Summer Collegiate League in the Central Division. Joining the Graders within that division are the Licking County Settlers from Newark, the Lorain County Ironmen from Lorain, the Lima Locos and the Grand Lake Mariners from Celina. The Graders begin their season Friday, June 9 in Newark against the Settlers and will play their home openerSaturday, June 10, at James D. Huddleston field in Heise Park against the Grand Lake Mariners. The first pitch is 7:05 p.m. Adult tickets at the gate are $5 each, college student tickets are $3 and children under five years of age are free at the gate. If you would like to purchase a ticket package or single game tickets in advance, email the Graders at galiongraders@gmail.com or call general manager Mike O’Leary at 419-571-8753. You can also visit Galion Youth Baseball’s website at www.galionyouthbaseball.com. Pitchers reporting for duty for Galion are (jersey numbers in parenthesis): Dustin Baird (27) from Brown; Brock Balderson (14) from Butler; Brody Basilone (24) from Northern Kentucky and Lexington, OH native; Clay Davies (25) from Ohio Dominican; Osvaldo Duran (16) from Rio Grande; Kyle Kovach (11) from Malone; Justin Longbrake (17) from Dayton; Jordan Peck (22) from Charleston; Hyatt Shenefield (4) from Walsh; Christian Specht (7) from Malone; and Sam Stewart (21) from Jefferson. The Graders pitching staff is listed as entirely a right-hand throwing squad and college experiences ranging from the freshman to senior levels. An additional note about the staff: they range from 5-feet, 10-inches (Shenefield) to 6-feet-8 (Baird). Galion will have three catchers . Dalton Henderson (32) is a sophomore from Ohio Wesleyan, Matthew Noel (5) is a junior from Malone and Parke Phillips (18) is a sophomore from Brown. Phillips is listed at 5-feet-10 inches and Henderson and Noel stand at 6 feet. All three catchers bat and throw from the right-hand side. The primary infielders are: Joe Crank (12), a sophomore from Malone; Matthew Freeman (33), a junior from Lenoir-Rhyne; Jacob Hoover (3)-, a junior from Hillsdale; Josh Kent (10), a junior from Lenoir-Rhyne; and Jarett Smetana (37), a sophomore from Kent State. All five infielders throw right-handed while Crank is listed as a switch-hitter and Kent bats from the left-side of the plate. Patroling the outfieldwill be: Grant Fuller (6), a junior from Lenoir-Rhyne, bats left and throws left; Braxton Giavedoni (23), a sophomore from Penn State, bats right and throws right; Austin Hathaway (1) from Charleston, who bats left and throws right; and Brady Hettinger (2), from IUPUI, who bats right and throws right. Cody Gabriel from Tri-C and Joe Weisenseel from Penn State are roster players for Galion, but on the disabled list. Taylore Baker remains the manager of the Graders. He was the pitching coach for Galion in the team’s first season and took over — last minute — as the head coach of the squad last season. “This season I had more of a hand in building the squad and recruiting for the team,” he said. The Graders have added two new faces to their coaching staff. AJ Cecil has joined the club as the pitching coach and Sam Fondriest will be the squad’s bench coach. Cecil is a senior and first-team all-GLIAC pitcher from the University of Findlay baseball team. Cecil appeared in 16 games, threw 17.1 innings of work, struck out 18 batters and finished the season with a 2.60 earned run average and five saves. He was also a member of the Graders in 2015 and 2016. Fondriest comes aboard the staff after being a four-year letter winner at Walsh University, in their infield. He is a third-year graduate assistant and junior varsity coach at Walsh. While playing there, he was a three-year starter at shortstop and started a season at second base. Mike O’Leary will get a break from coaching and handle solely the general manager duties. Gary Frankhouse is the treasurer for the team and Justin McMullen the president. Members of the Galion Graders mingle around the batting cage at Heise Park during practice Thursday. The Graders opened the season Friday in Newark. The team’s home opener is Saturday at 7 p.m. at Heise Park. 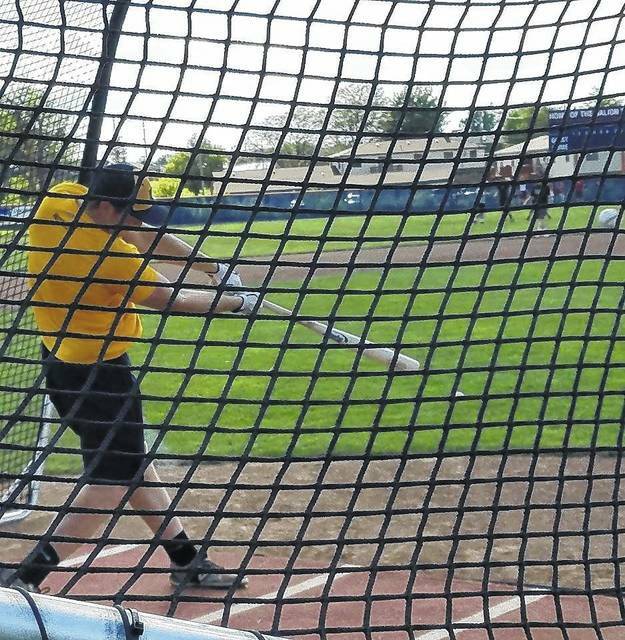 A member of the Galion Graders takes batting practice Friday at Heise Park. The team got together for the first time this week. After opening on the road in Newark on Friday, the Graders take on Grand Lake Mary on Saturday at Heise Park at 7 p.m.